A 21 year old male presented with fever, weakness and petechiae. The haemogram showed a haemoglobin of 7.2g/dL, WBC count of 21.3 × 109/L and platelets of 23 × 109/L. Peripheral smear showed 63% blasts. He was diagnosed to have a acute biphenotypic leukaemia on a bone marrow. As shown in the adjacent image he had hypertrophic gums. Gum hypertrophy is seen in 3-5% of patients with leukemia. About two third of the patients with leukemia associated gum hypertrophy have acute monoblastic leukemia, about a fifth acute monomyeloid leukemia and about 4% are myeloid leukemia. 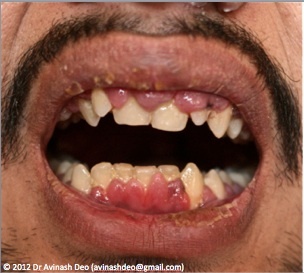 Hypertrophy may be accompanied by other leukemia related changes including infection and hemorrhage of the gums. Gingival hypertrophy is not seen in edentulous patients. But there does not seen=m to be any relationship between gingival hypertrophy and other dental pathologies like dental caries. Patients with promyelocytic leukemia may develop gingival hypertrophy on initiation of all trans retinoic acid treatment. Gum hypertrophy developing in a patient with myelodysplasia signifies a transformation to a more aggressive course. Other conditions that can cause gum hypertrophy include neurofibromatosis 1, Wegener’s granulomatosis, sarcoidosis, Crohn’s disease, Primary amyloidosis, Kaposi sarcoma, acromegaly, lymphoma and drugs (Phenytoin, cyclosporine, amlodipine and nefedipine). J Can Dent Assoc 2000; 66:78-9 is a comprehensive article on gum hypertrophy in leukemia.